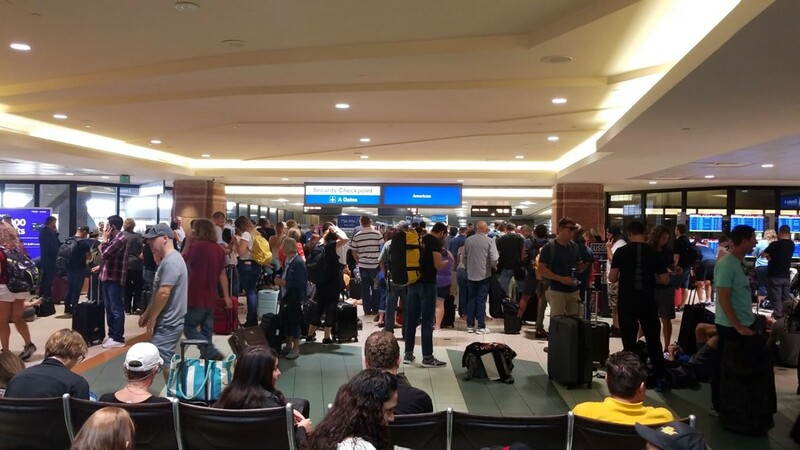 Portions of Terminal 4 at Phoenix Sky Harbor International Airport were reopened Sunday morning after a multi-hour closure, prompted by a suspicious abandoned rental car, snarled air traffic and led to the cancellation of numerous flights. 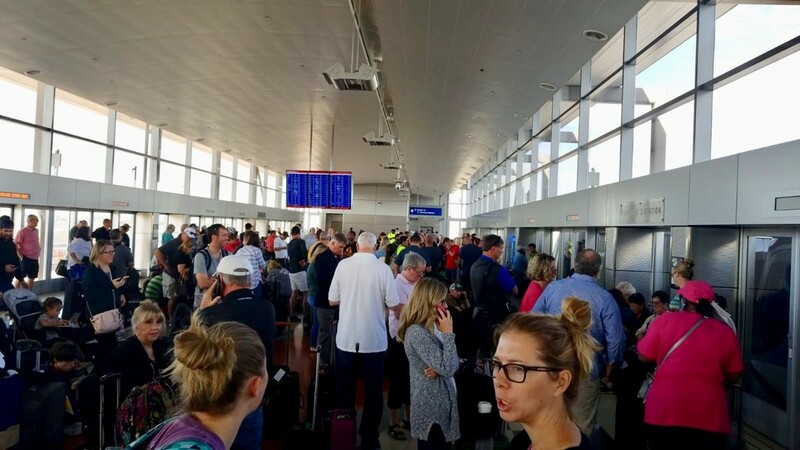 The airport was completely open at about 11:15 a.m. local time (2:15 p.m. ET) after Phoenix police determined the car was not a threat. 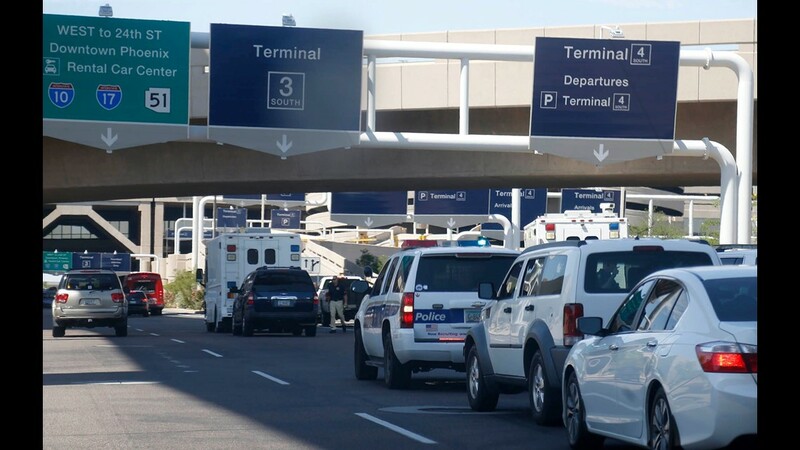 Phoenix police officers working at the airport spotted the unattended rental car on the curb line of the upper deck of Terminal 4 at about 7 a.m. The bomb squad was then called out to determine whether the car was actually a threat. Sgt. Tommy Thompson, a Phoenix police spokesman, said investigators were still checking the vehicle at 11 a.m.
"It's a lengthy process," he said in a press conference. Update - Operations are returning to normal at Terminal 4. 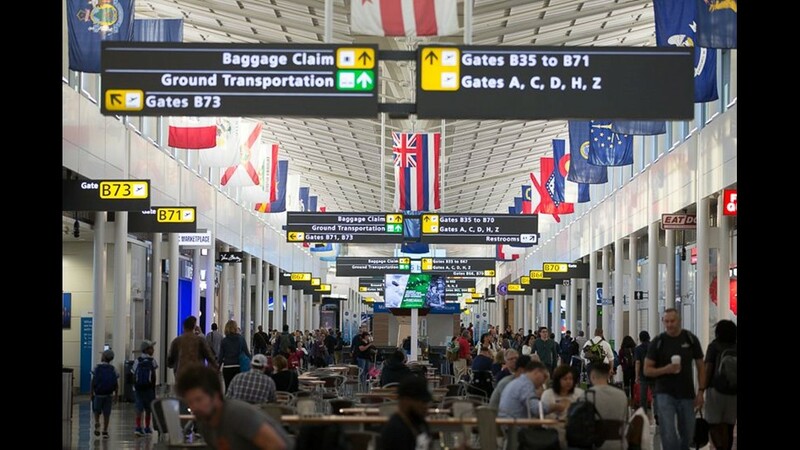 Travelers are encouraged to continue to check their flight status with their airlines. Police had yet to identify the owner of the car. Gregory Roybal, a spokesman for the airport, encouraged travelers to confirm the status of flights with their airlines. 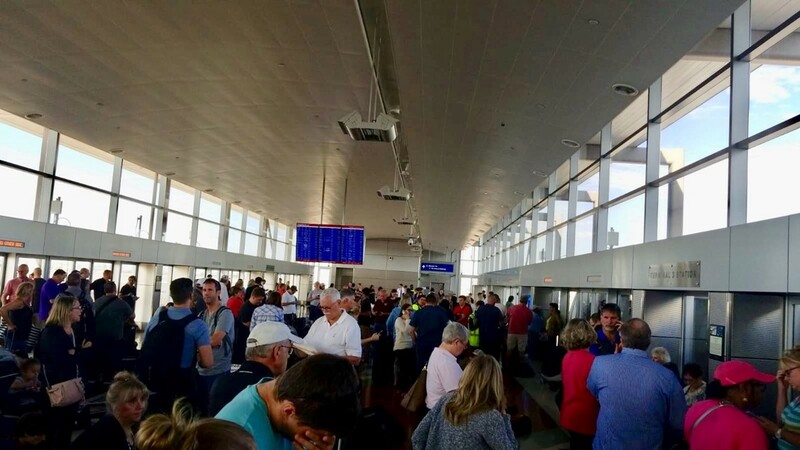 The east side of the terminal, before the security checkpoints, had been evacuated for at least three hours Sunday morning. 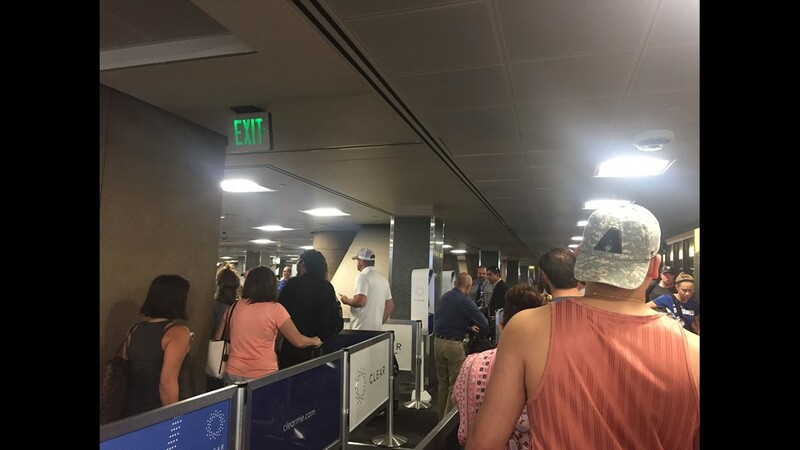 Three of the four security checkpoints were closed, and the PHX Sky Train was not dropping off passengers at Terminal 4. "Police are working to resolve this as soon as possible," Roybal told The Arizona Republic in an email. 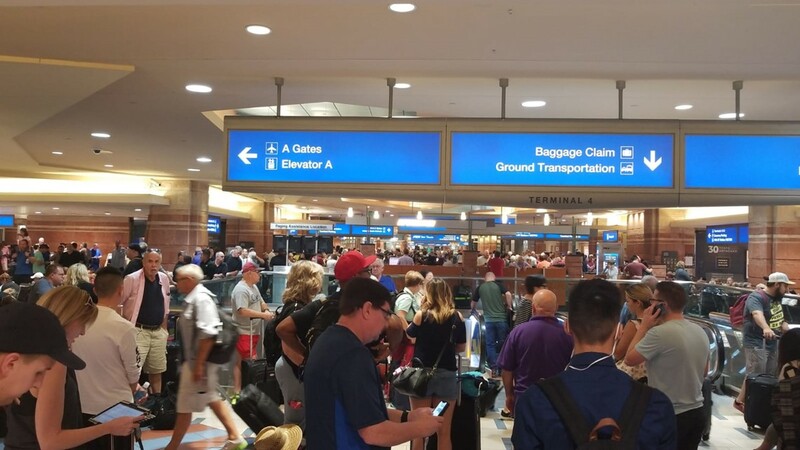 Flight-tracking web site FlightAware showed hundreds of flights had been delayed Sunday, either in leaving or in arriving at Sky Harbor. The site showed nearly 30 canceled flights, mostly on Southwest Airlines. 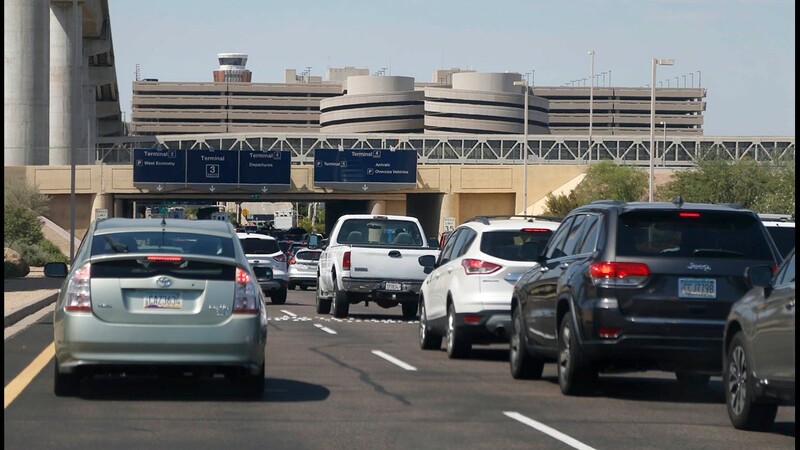 Traffic slows trying to enter Terminal 4 after its closure at Sky Harbor Airport in Phoenix on Sept. 16, 2018. Phoenix Sky Harbor International Airport travelers wait for updates Sunday, Sept. 16, during a closure at Terminal 4 due to police activity. 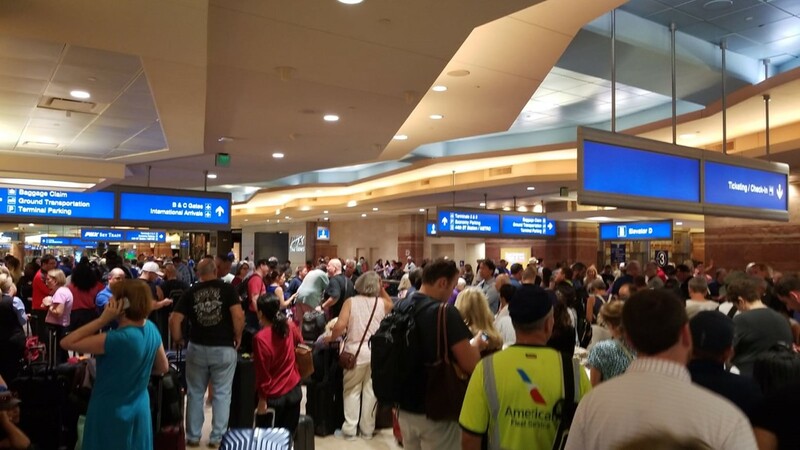 People begin passing through security lines Sunday, Sept. 16, at Phoenix Sky Harbor International Airport after Terminal 4 was reopened following a security investigation. 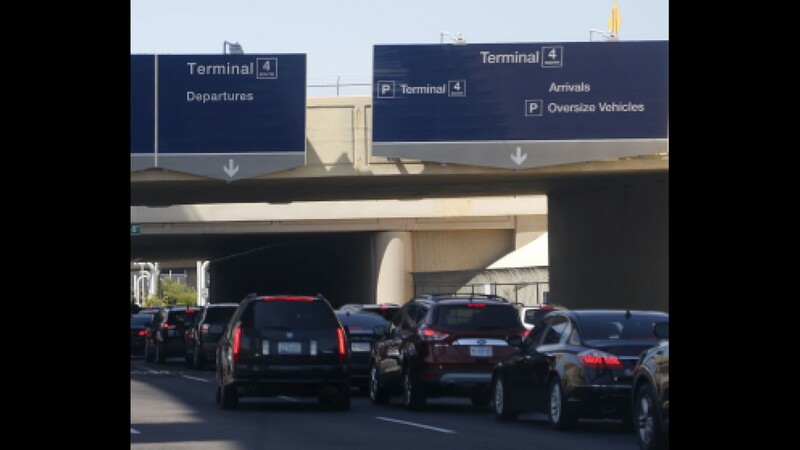 Traffic slows outside Terminal 4 after its closure at Sky Harbor Airport in Phoenix on Sept. 16, 2018. Dian Squire spent hours stuck in the Sky Train lobby while his American Airlines flight to Detroit was delayed multiple times. 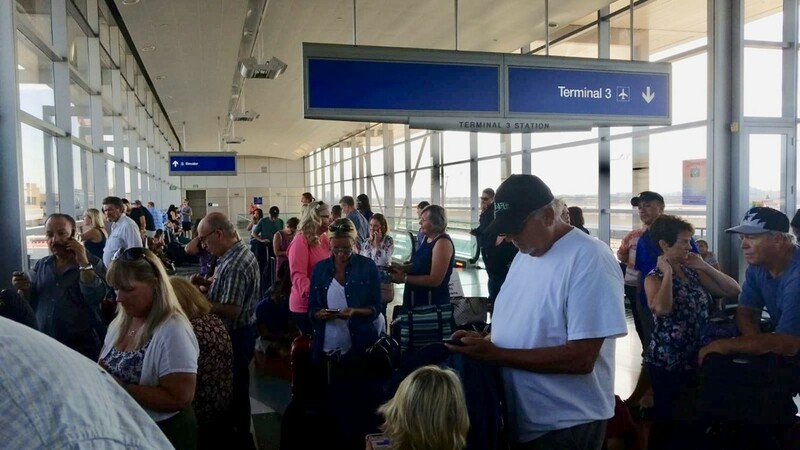 He said dozens of people were sitting on the floor as they waited for any information from the Transportation Security Administration or airport staff. "That seems a little poor from a crowd-control perspective," he said. Airport volunteers brought therapy dogs to help calm the growing crowd. 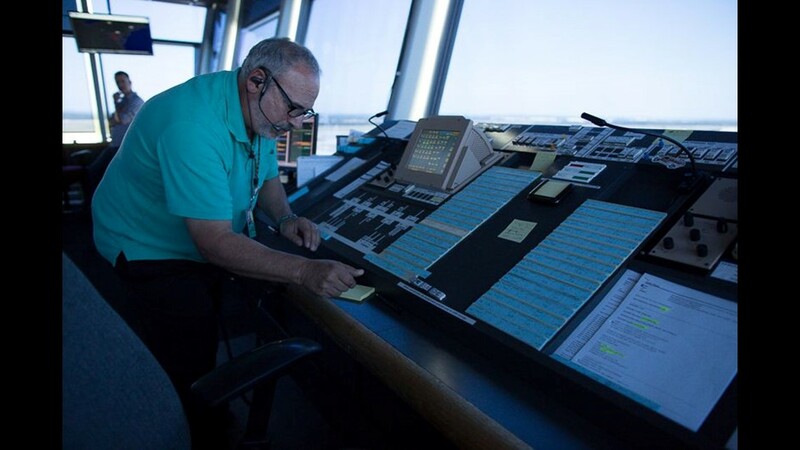 Passengers speculated about whether they could see any planes taking off or landing. Squire said the stuck travelers didn't seem frustrated too with the situation. "People are surprisingly calm," Squire said. "I think a security threat is more manageable in people’s mind than a plane delay for other reasons. 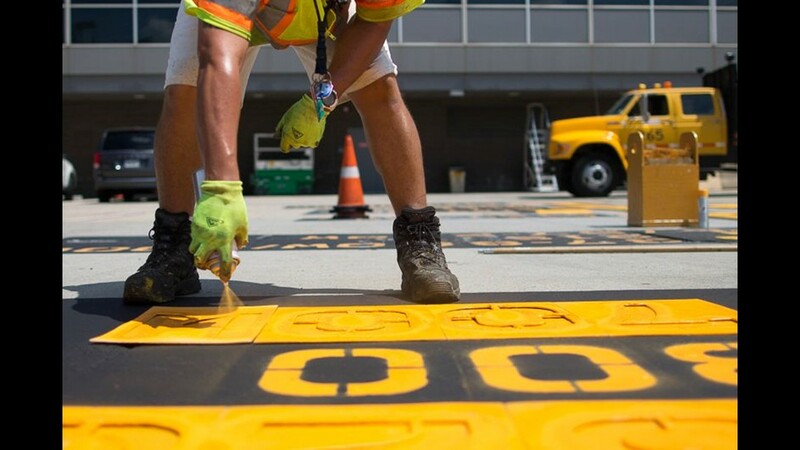 I bet that’s different for people stuck in the terminal itself." His flight was pushed to 4:15 p.m. local time after the airport reopened. 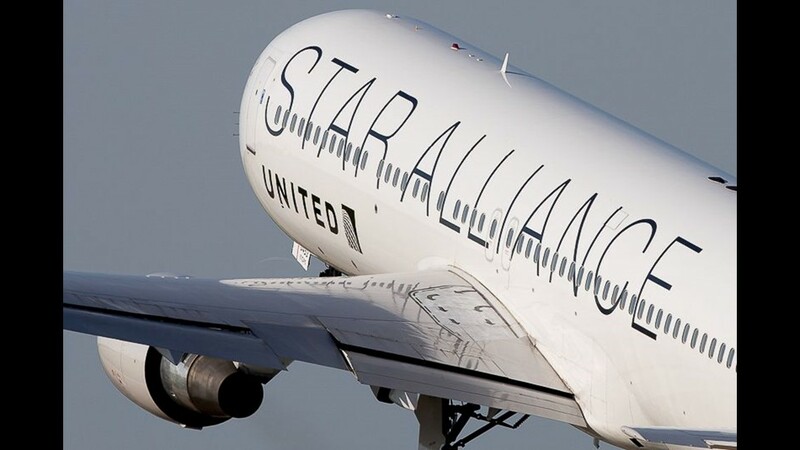 By noon, passengers were taking about 25 minutes to get through security and into Terminal 4, though lines were closed briefly because the system was so crowded with passengers. 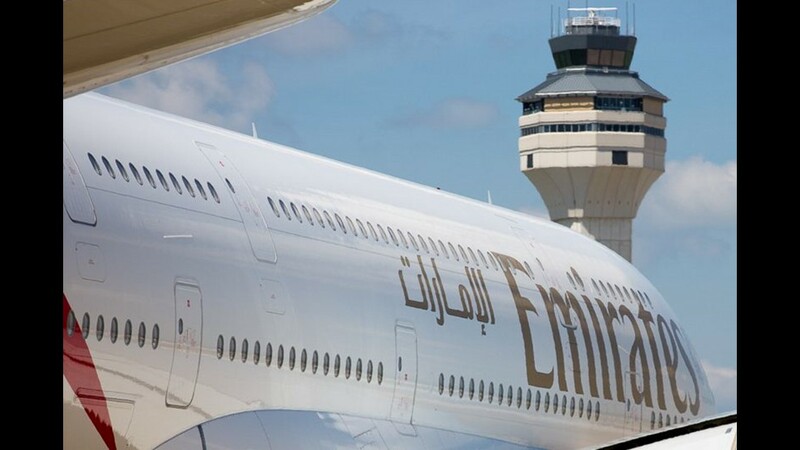 An Emirates Airbus A380 taxies out for departure past the FAA tower at Washington Dulles International Airport on June 29, 2018. 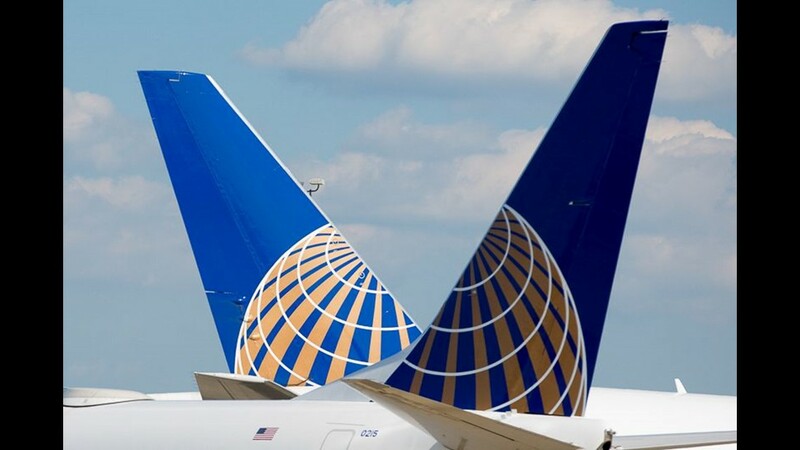 United Airlines' tails at Washington Dulles International Airport on June 29, 2018. 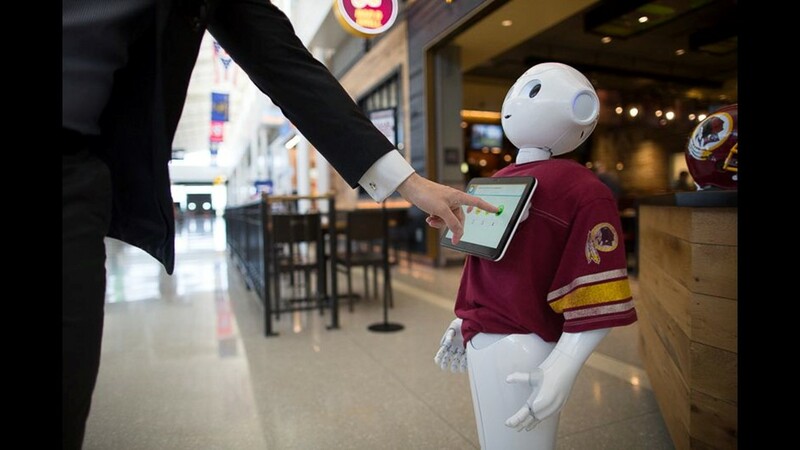 A friendly robot asks for feedback outside of a sports-themed restaurant at Washington Dulles International Airport on June 29, 2018. 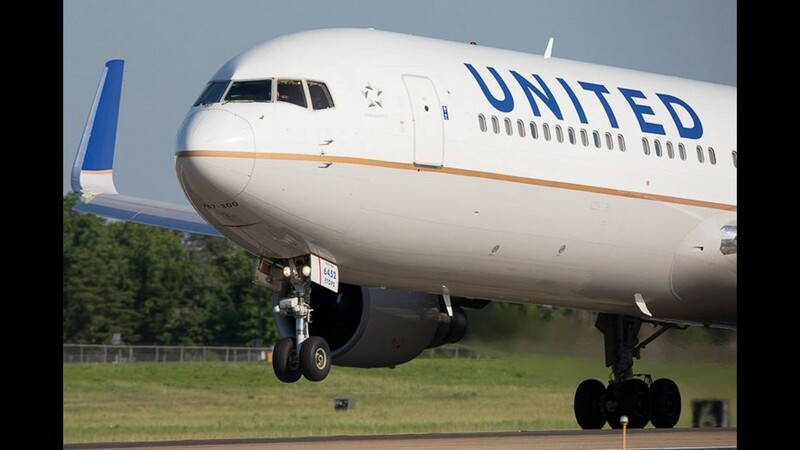 A United Airlines Boeing 767-300 takes off from Washington Dulles International Airport on June 29, 2018. 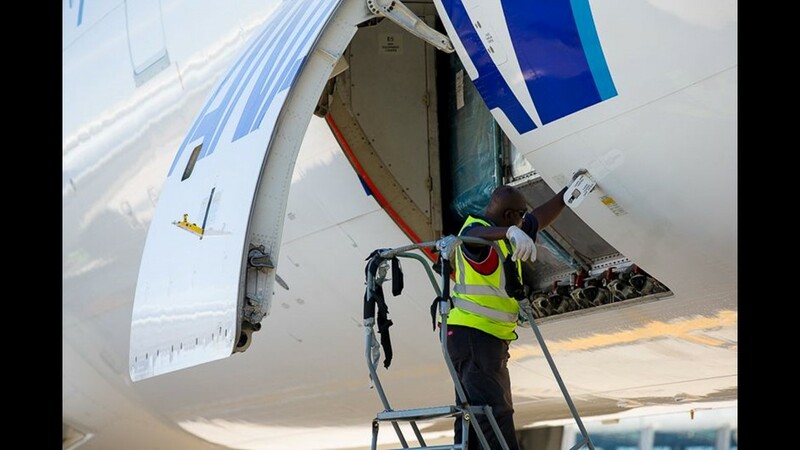 A ramp worker opens up the front cargo door on an All Nippon Airways Boeing 777-300 after it arrived from Tokyo to Washington Dulles International Airport on June 29, 2018. 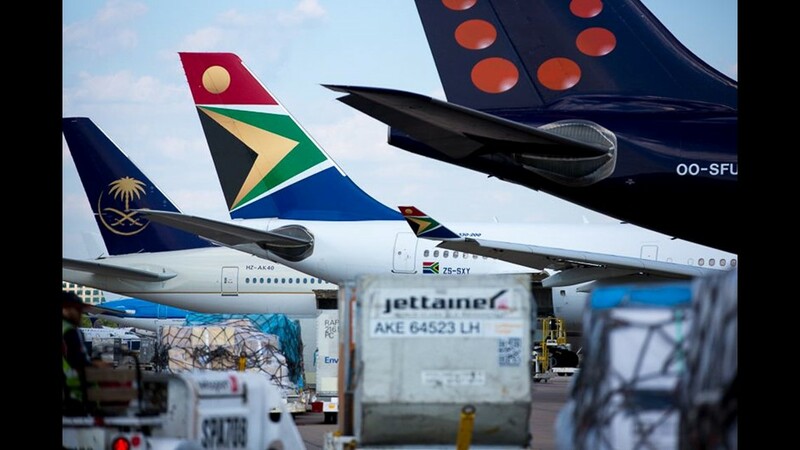 Tails representing a wide variety of international airlines line a terminal at Washington Dulles International Airport on June 29, 2018. 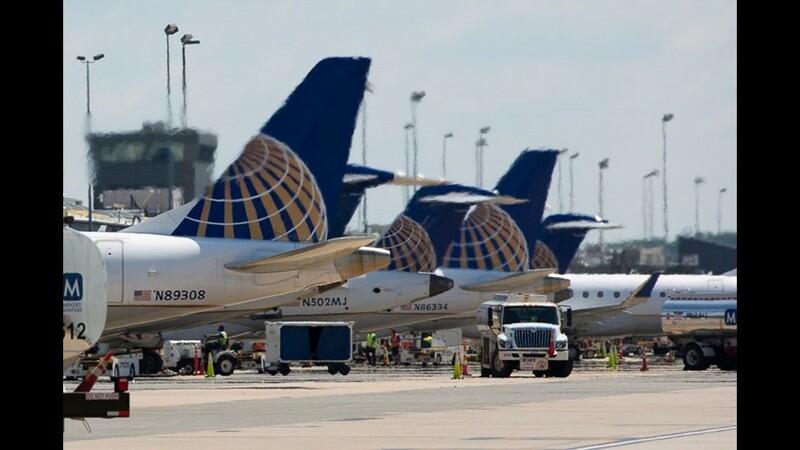 A particularly warn stretch of ramp lists numerous aircraft types at a parking stop at Washington Dulles International Airport on June 29, 2018. 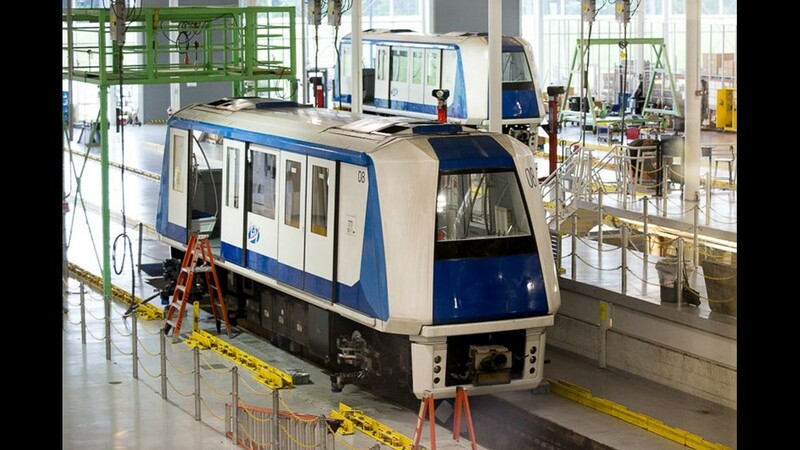 Two AeroTrain cars await work at a maintenance facility at Washington Dulles International Airport on June 29, 2018. 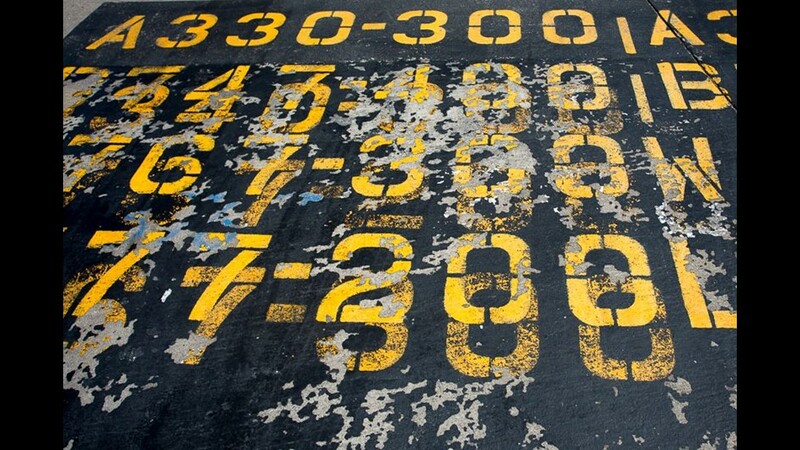 Hector Murcia spray paints aircraft names onto the parking locations on a terminal A ramp at Washington Dulles International Airport on June 29, 2018. 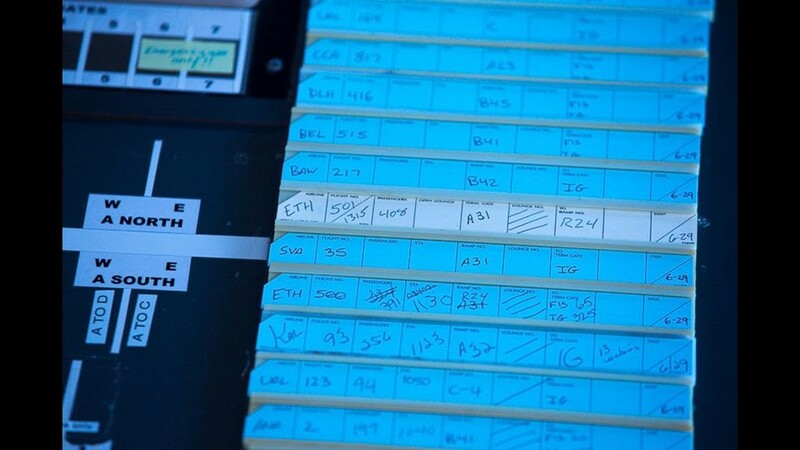 Slips of paper note details on incoming international flights at Washington Dulles International Airport on June 29, 2018. Each will need mobile lounges to take the passengers to immigration control. 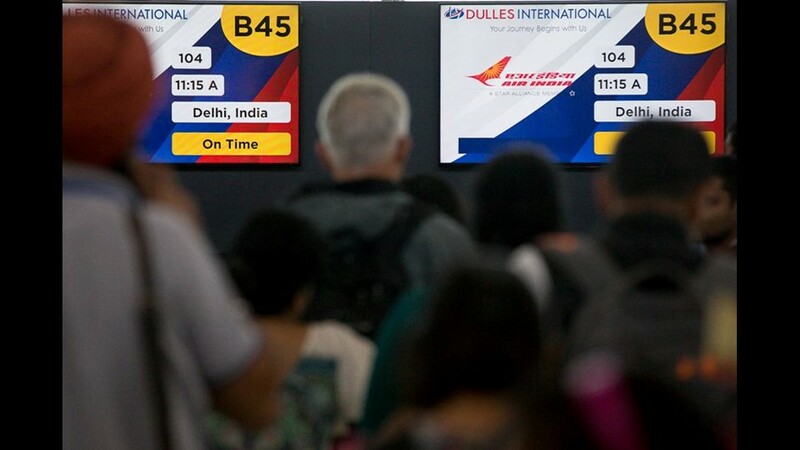 Passengers queue to board an Air India flight to Delhi at Washington Dulles International Airport on June 29, 2018. 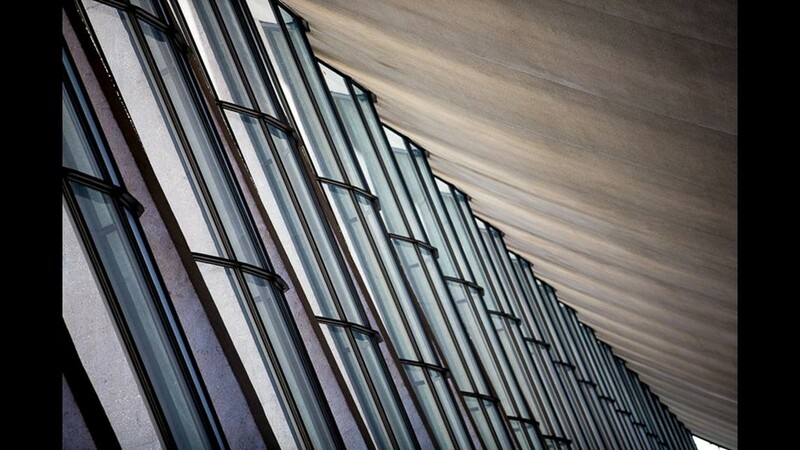 The unique architecture of Washington DC's Dulles International Airport, seen on June 29, 2018. 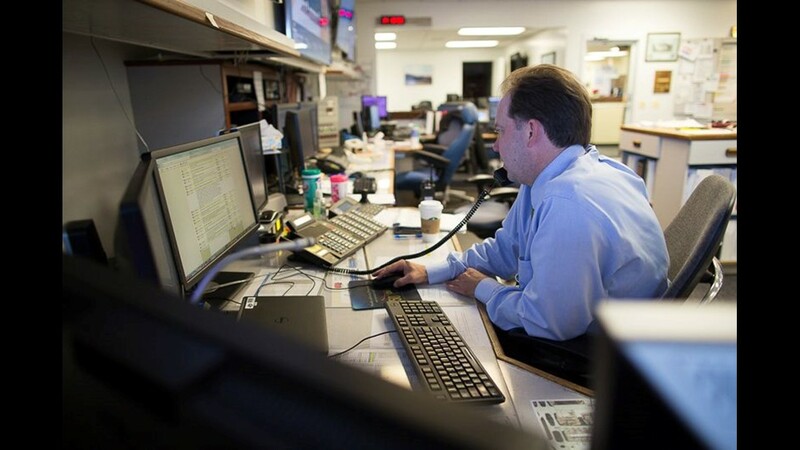 Duty Manager Brad Weems, working in operations, takes a phone call during an afternoon shift at Washington Dulles International Airport on June 29, 2018. 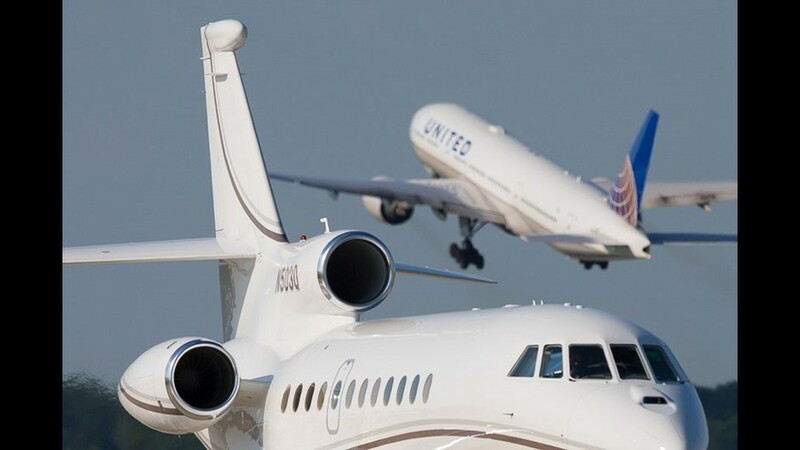 A business jet taxies out for departure as a United Airlines Boeing 777 heads off into the evening from Washington Dulles International Airport on June 29, 2018. 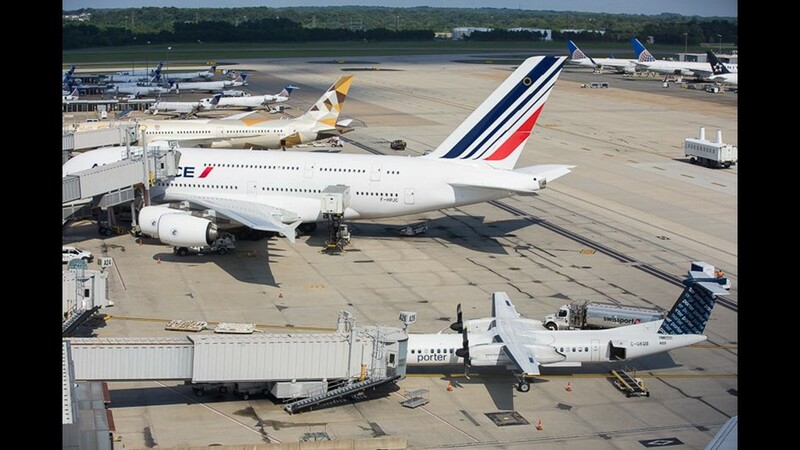 An Air France A380 dwarfs the nearby porter Q400 turboprop at Washington Dulles International Airport on June 29, 2018. 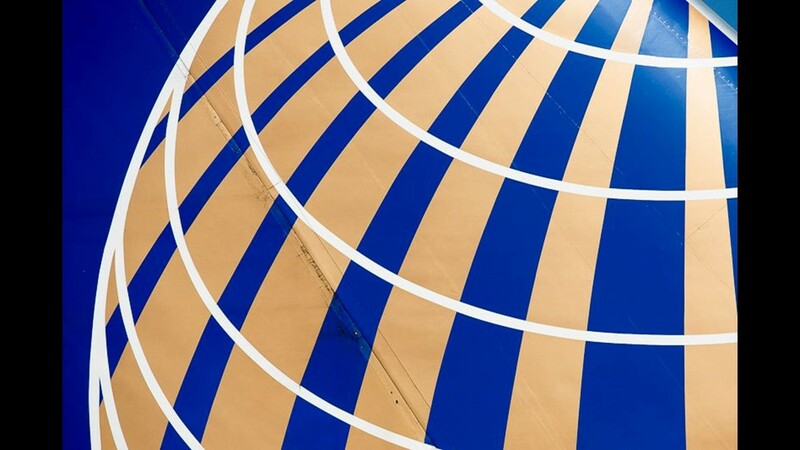 United Airlines logo is seen at Washington Dulles International Airport on June 29, 2018. 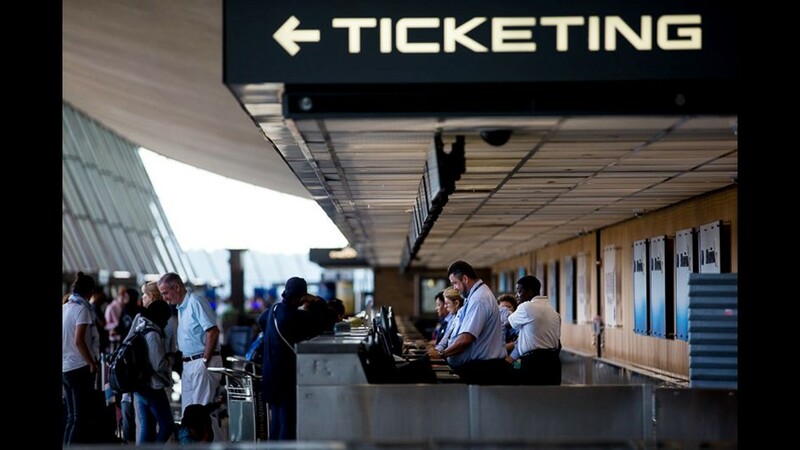 The unique font of Washington's Dulles International Airport frames a ticket agent processing passengers early in the morning on June 29, 2018. 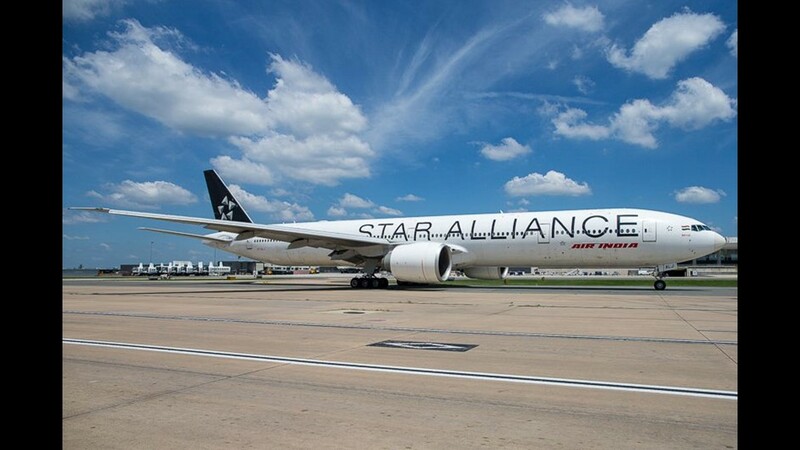 Clad in a Star Alliance scheme, an Air India Boeing 777-300 sets out for New Delhi, India, at Washington Dulles International Airport on June 29, 2018. 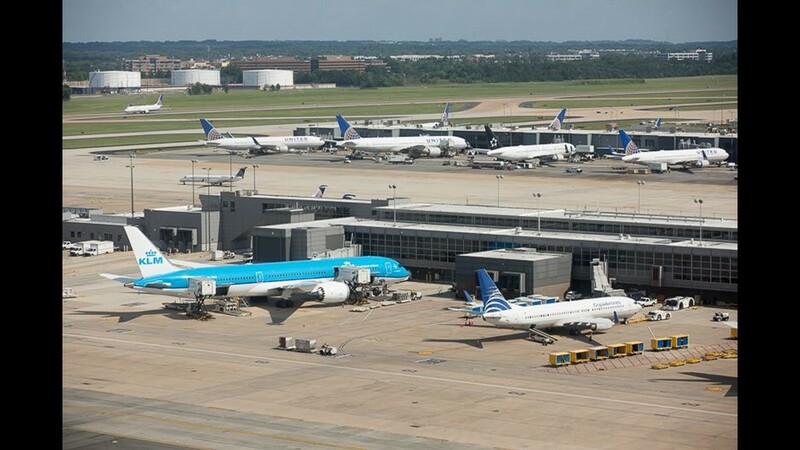 Passengers mill about Terminal B in Washington Dulles International Airport on June 29, 2018. 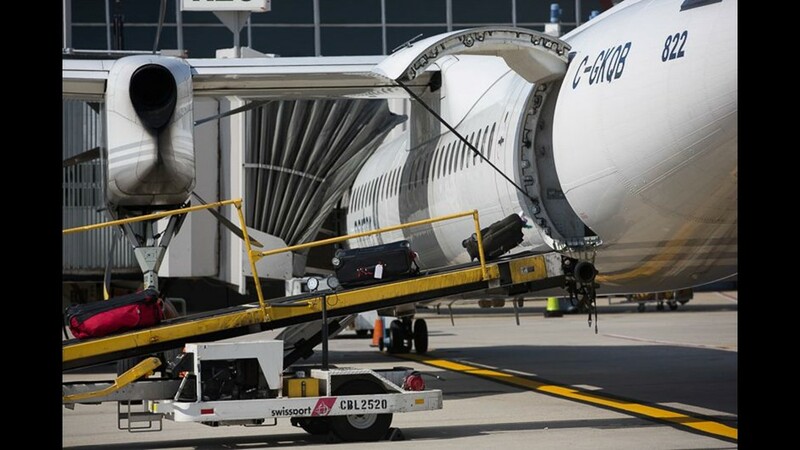 Bags take a ride down a conveyor belt after arriving on a Porter Bombardier Q400 from Toronto at Washington Dulles International Airport on June 29, 2018. 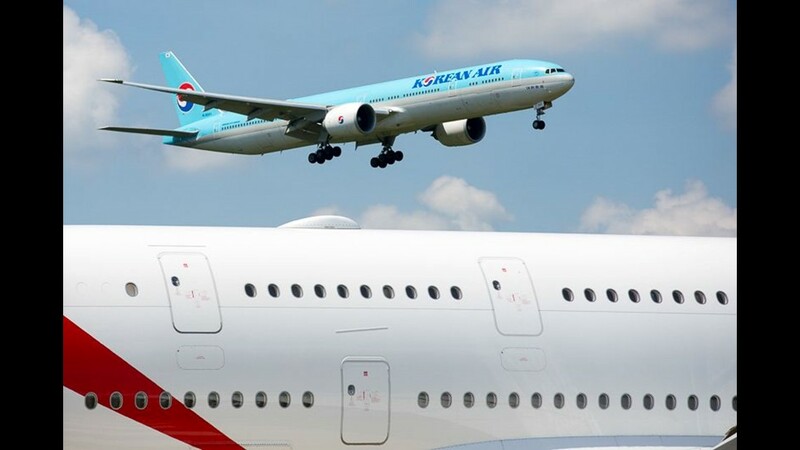 A Korean Air Boeing 777-300 lands at Washington Dulles International Airport on June 29, 2018 as an Emirates A380 waits to depart for Dubai. 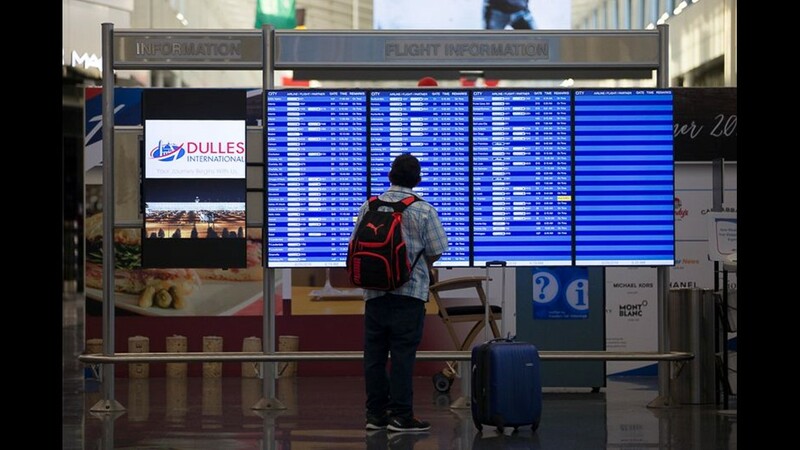 A passengers checks on a connecting flight at Washington Dulles International Airport on June 29, 2018. 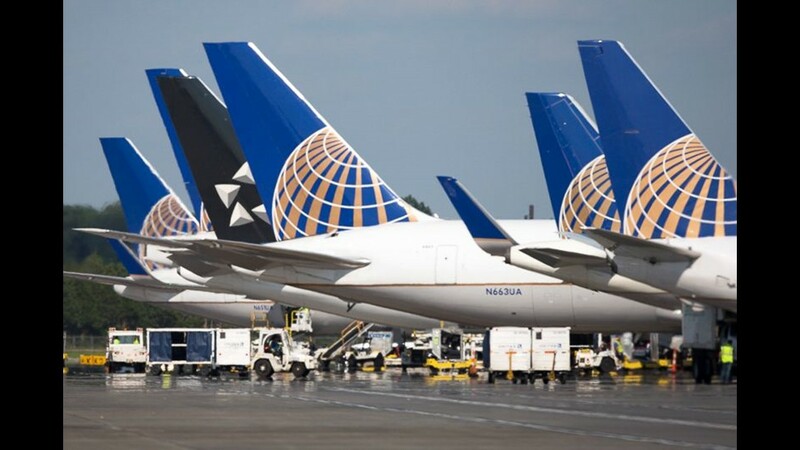 United Airlines jets are readied for their next flight at Washington Dulles International Airport on June 29, 2018. 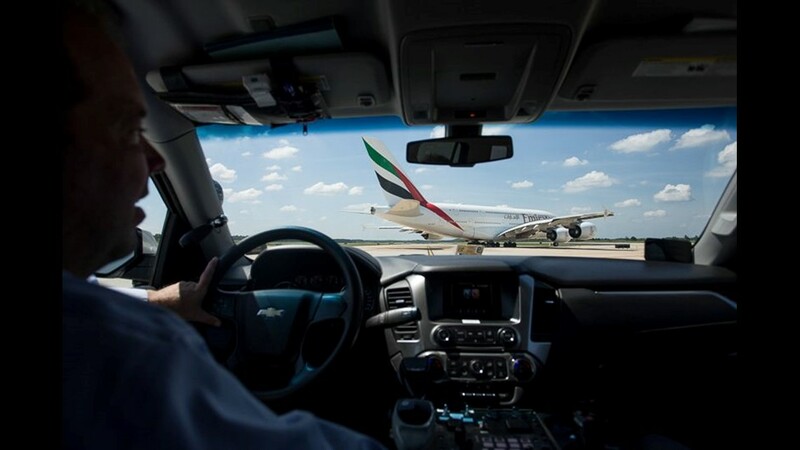 Airport operations escorts the massive Airbus A380 as it taxies out for departure at Washington Dulles International Airport on June 29, 2018. 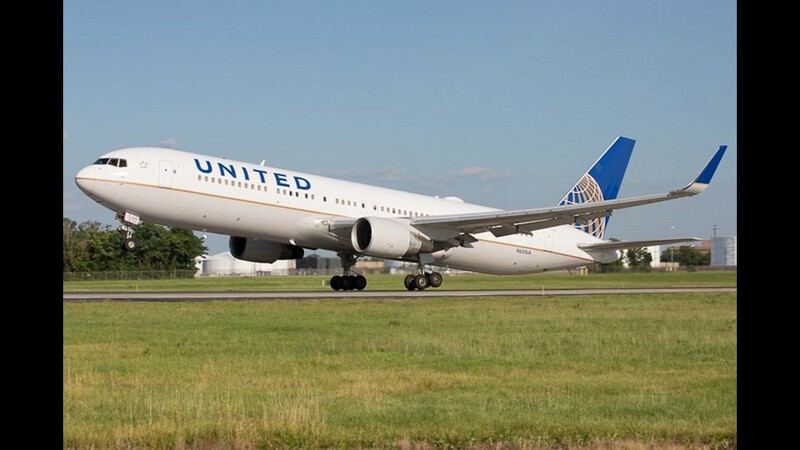 The jet's wingspan is so large it can reach past the taxiway, presenting a risk of damaging equipment. 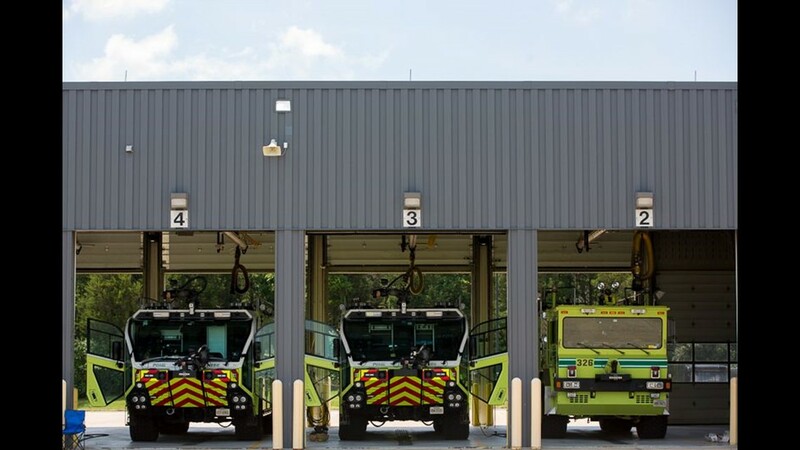 Fire trucks await a call they hope never comes at a remote station at Washington Dulles International Airport on June 29, 2018. A mobile lounge controller directs the unique busses around Washington Dulles International Airport on June 29, 2018. 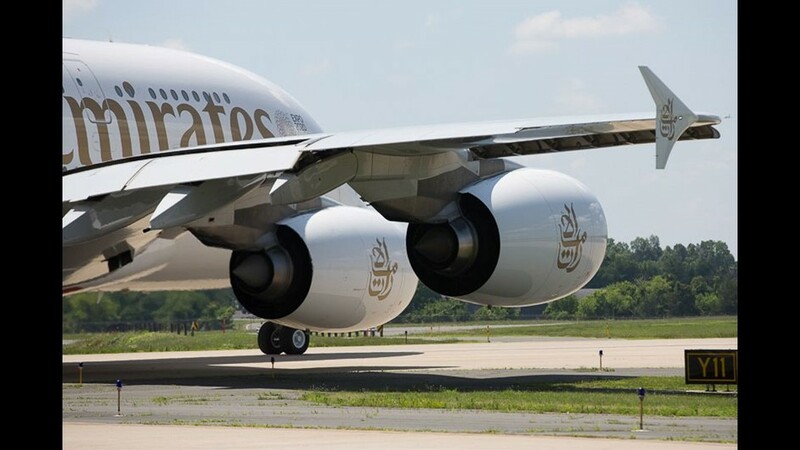 The position is likely the only such in the U.S.
An Emirates Airbus A380 taxies out to Runway 30 at Washington Dulles International Airport on June 29, 2018. 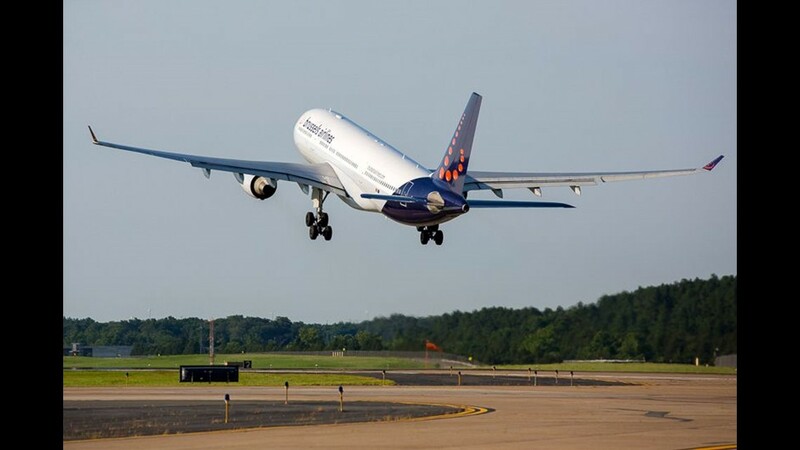 A Brussels Airlines Airbus A330 takes off from Washington Dulles International Airport on June 29, 2018. 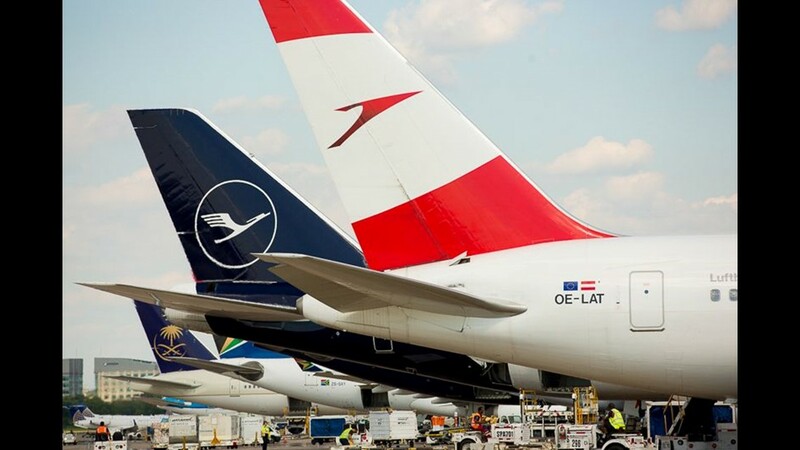 Planes line up at their gates at Washington Dulles International Airport on June 29, 2018. 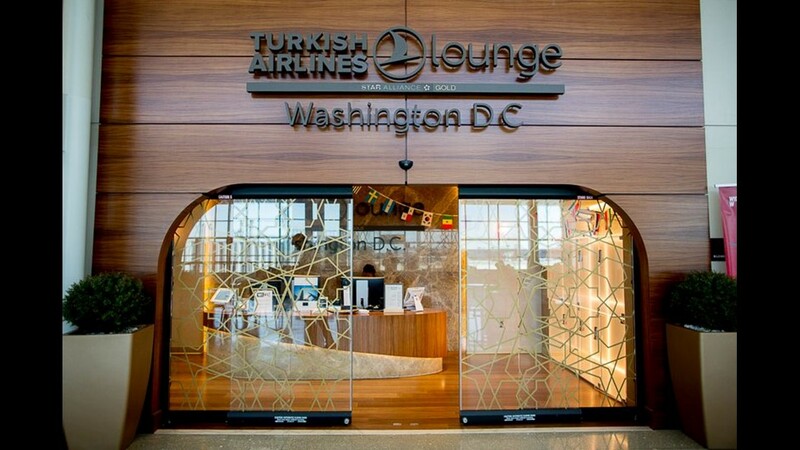 Doors slide shut at the Turkish Airlines lounge at Washington Dulles International Airport on June 29, 2018. 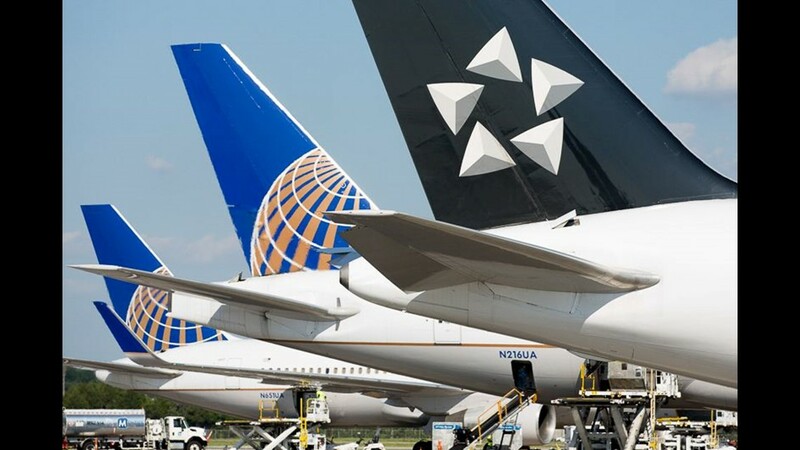 Tails representing a wide variety of international airlines line the terminal at Washington Dulles International Airport on June 29, 2018. 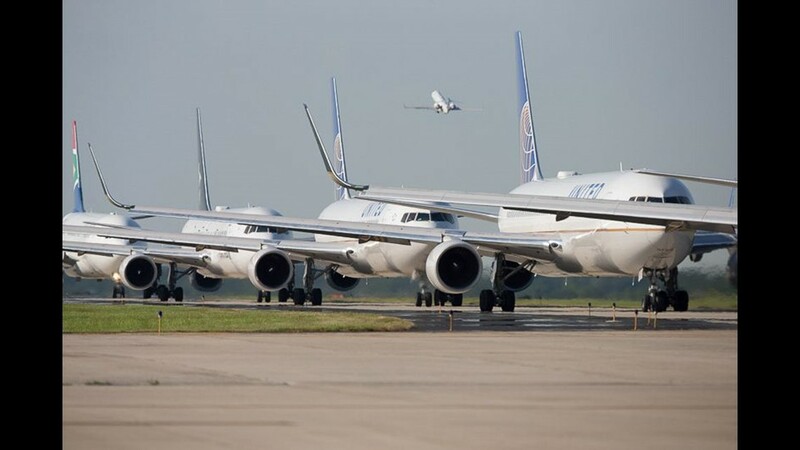 United Airlines jets queue in line to depart Washington Dulles International Airport on June 29, 2018. 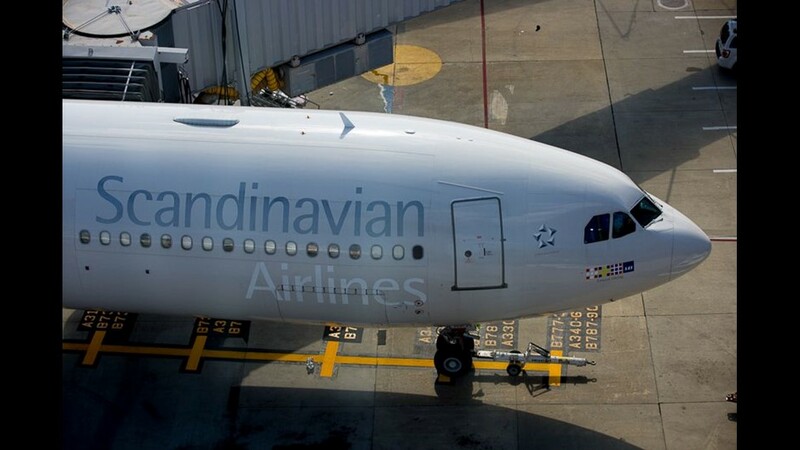 A Scandinavian Airlines Airbus A330 boards for its flight back to Europe at Washington Dulles International Airport on June 29, 2018. 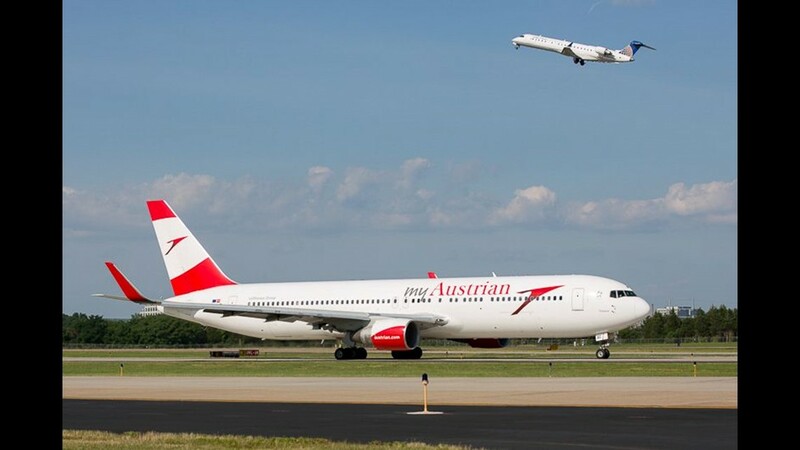 An Austrian Airlines Boeing 767 taxies out for departure as a United Express CRJ takes off from Washington Dulles International Airport on June 29, 2018. 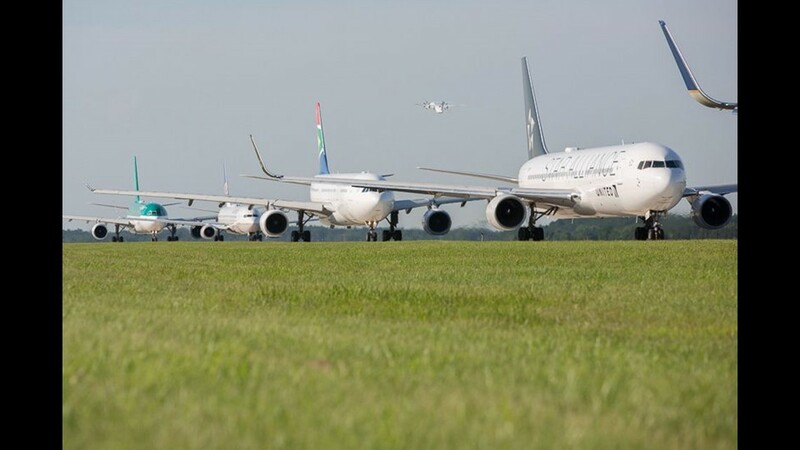 Aircraft line up for the evening departures bank at Washington Dulles International Airport on June 29, 2018. 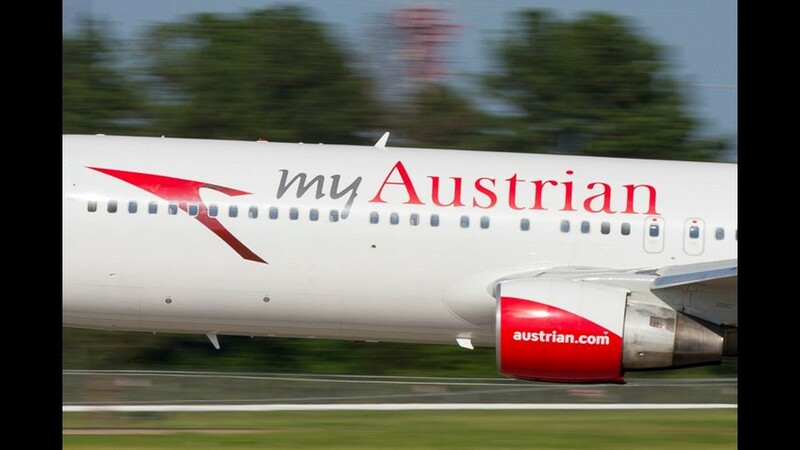 An Austrian Airlines Boeing 767 departs for Europe at Washington Dulles International Airport on June 29, 2018.